Geldy Kyarizov in historical costume. A long-time advocate of Turkmenistan’s iconic Akhal Teke horses who completed a remarkable 4300km ride to highlight the strength of the breed, has been recognised for his efforts. Geldy Kyarizov has become the first Turkmen to be made a Fellow of the Royal Geographical Society. He has also been made a fellow of the Long Riders’ Guild, joining an elite group of equestrian explorers to be honoured by both organisations. Kyarizov recognized the desperate need to save Turkmenistan’s endangered Akhal Teke horses in the late 1980s. He immersed himself in protecting, preserving and promoting the breed. Geldy Kyarizov’s Akhal Teke stallion, Yanardag, appears on the national symbol of Turkmenistan. This ancient line, which dates back to days of antiquity, had become endangered during the time of the Soviet Union. To promote the cause, Kyarizov rode 4300 kilometres from Ashgabat to Moscow. The journey, which took him across Uzbekistan and Kazakhstan, required him to ride 360 kilometres across a waterless desert. Upon his arrival at the Russian capital, Geldy successfully petitioned Soviet Union government officials to intercede on behalf of Turkmenistan’s horses. 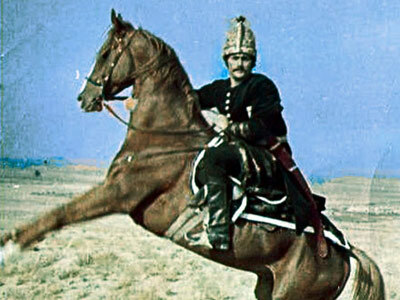 His induction into the Guild recognises him as the Turkmen Long Rider in the history of modern equestrian travel. In the years after his ride, he has continued to make valuable contributions as a historian and breeder of Akhal Teke horses. Geldy Kyarizov, left, is congratulated by former Turkmen president Sapurmurat Turkmenbashi. After extensive travels to various parts of the Soviet Union he managed to locate prized specimens of the Akhal Teke blood line. He then began a breeding programme to preserve the horses for posterity. The most renowned success in his breeding programme was Yanardag. He was an Akhal Teke stallion considered so beautiful and perfect that the president of Turkmenistan placed his image on a national stamp, ordered a statue erected in his honour and named Yanardag as the national symbol of the country. Maksat was another stallion that marked the breed’s resurgence. This stallion, who has a pedigree going back thousands of years, was presented to then British Prime Minister John Major as a gift from the Turkmen nation. Following Kyarizov’s initial success as a breeder, traveller, lecturer and educator, he secured government funding to establishment a large equestrian complex in the capital, complete with the nation’s first veterinary laboratory able to perform the DNA testing necessary to set up a new stud book for the Akhal Teke. Geldy Kyarizov’s route from Ashgabat to Moscow, which he rode in his bid to save the Akhal Teke breed. On the 10th anniversary of Turkmenistan’s independence, he organized the “Parade of the Horses”, during which more than 1000 Akhal Tekes marched through the hippodrome in Ashgabat. His educational conferences, equestrian journeys, academic investigations, and genetic research have proved invaluable in promoting the national breed. Kyarizov has been acknowledged by scientists, breeders and equestrians worldwide as an expert on Akhal Teke horses. As a result of his efforts, in 1998 the president of the time, Sapurmurat Turkmenbashy, appointed him the General Director of “Turkmen Atlary”, a Cabinet level government position which placed him in charge of the state equestrian organisation of Turkmenistan. Please write more about this amazing person.